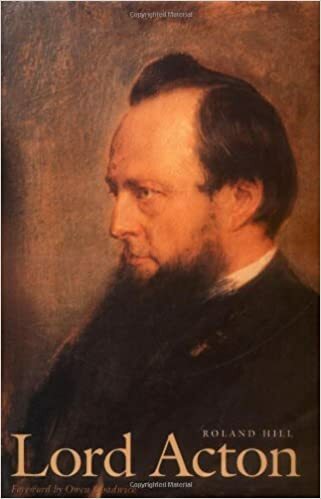 I am presently reading Lord Acton by Roland Hill. US HERE UK HERE It was highly recommended to me by Fr. Robert Sirico of ACTON INSTITUTE. I found this passage, which deals with Acton’s most famous quote, relevant to one of the candidates in the presidential campaign. If there is any presumption it is the other way, against holders of power, increasing creasing as the power increases. Historic responsibility has to make up for the want of legal responsibility. Power tends to corrupt, and absolute power corrupts absolutely. Great men are almost always bad men, even when they exercise influence and not authority: still more when you supcradd the tendency or the certainty of corruption by authority. There is no worse heresy than that the office sanctifies the holder of it…. You would hang a man of no position, like Ravaillac; but if what one hears is true, then Elizabeth asked the gaoler to murder Mary, and William III ordered his Scots minister to extirpate a clan. Here are the greatest names coupled with the greatest crimes. You would spare these criminals, for some mysterious reason. I would hang them higher than Haman, for reasons of quite obvious justice; still more, still higher, for the sake of historical science. Hans’t Hillary Clinton been given a kind of get out of gaol card? Acton was an amazing fellow. This book is fascinating. One of the things I found most interesting was the description of the machinations surrounding the First Vatican Council and the dogma of infallibility. Fighting over doctrine is serious business! If you consider that in the ancient Church people would literally riot if they heard an unfamiliar Latin version of Scripture, and that the homoousios was debated even in butcher shops, today’s little spats are calm and bloodless. This entry was posted in The Drill and tagged Acton Institute, Lord Acton. Bookmark the permalink. If you consider that in the ancient Church people would literally riot if they heard an unfamiliar Latin version of Scripture, and that the homoousios was debated even in butcher shops, today’s little spats are calm and bloodless. Frankly, it’s unfortunate that we have become so tame. If there were still a danger of rioting over innovations, the Church’s enemies within would never have succeeded in transforming her into something almost unrecognizable from what she had been. But he was against the definition of papal infallibility at Vatican I, and hardly for the reasons Cardinal Newman was. I often use that famous quote about power, so true! Regarding the other items, my daughter saw an actual bumper sticker, “Hillary for prison, 2016”. It’s so appropriate that I almost fell off my chair laughing. The whole thing is no laughing matter, however. But fear not, God’s in control! No one gets a pass at their particular judgment, do they? Don’t think there aren’t more than a few on that won’t still riot if they heard a scrap of unfamiliar Latin (i.e. ANY Latin) in church. For those who haven’t been by the Acton Institute, the site may be worth a look. “Regarding the other items, my daughter saw an actual bumper sticker, “Hillary for prison, 2016”.